VIDEO: Damon Tucker interviews Mayor Harry Kim. UPDATE: Saturday, Jan. 13, 2018, 11:13 a.m.
Maui County Emergency Management Agency Officer Herman Andaya told Big Island Now just before 11 a.m. today that the incident occurred during a shift change at the State of Hawai‘i Emergency Management Agency in Honolulu. 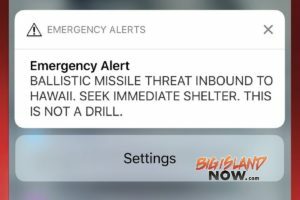 It is the State of Hawai‘i Emergency Management Agency that sounds these alerts, Andaya said. There are three shift changes throughout day at HEMA, operating 24/7, he said. “It is our understanding that at the 8 a.m. shift change, someone ‘hit the wrong button’—erroneously sounding the alert,” he said. The public should also be reminded that prior to an emergency, make a plan, create an emergency kit and stay informed (see “EMERGENCY KIT RECOMMENDATIONS” below). A guidance summary of what to do in the event of an actual attack can be found online. “I am outraged that a mistake of this magnitude occurred. The initial alert was sent out via Civil Defense at 8:15am HST and it took the Hawaiʻi Emergency Management Agency over 38 minutes to clarify that the “alarm” was inadvertent and indeed a mistake. The panic and pandemonium that many in Hawaiʻi experienced was unwarranted and completely unnecessary. Gov. 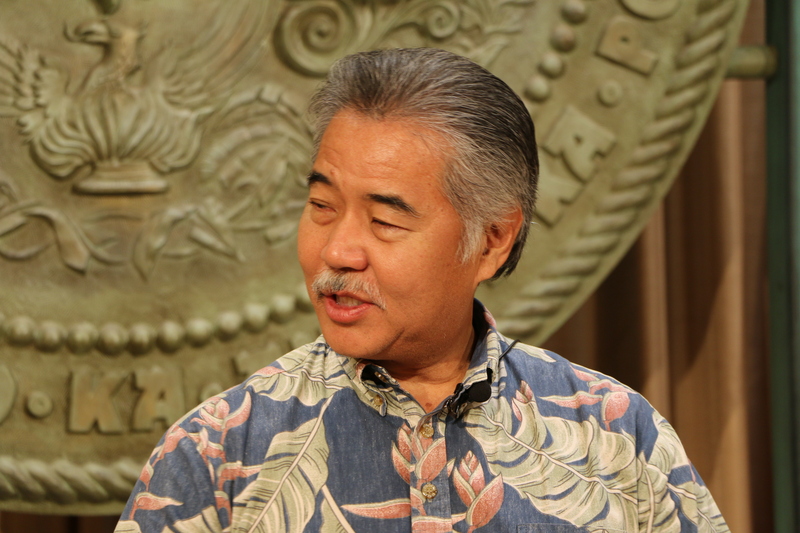 David Ige is meeting this morning with top officials of the State Department of Defense and the Hawai‘i Emergency Management Agency to determine what caused this morning’s false alarm and to prevent it from happening again. ORIGINAL POST: Saturday, Jan. 13, 8:10 a.m. 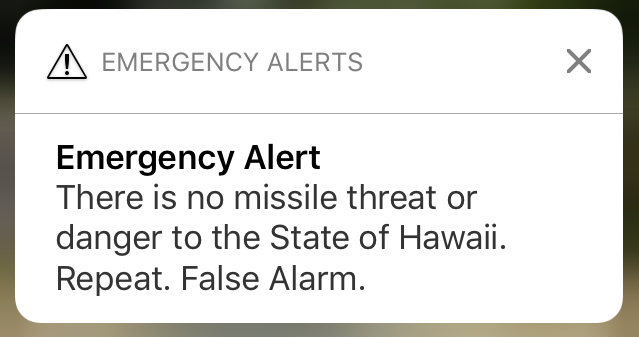 The alert sent out at 8:07 a.m. is an official false alarm, according to Hawai‘i County Civil Defense. According to a police officer interviewed by Big Island Now Reporter Damon Tucker in front of Hawai‘i County Civil Defense headquarters, the alarm was sent in error. It was supposed to be a scheduled test. A disaster alert was sent out at 8:07 a.m. About 30 minutes later, officials released information about the false alarm. In the meantime, there was no additional information available on radio or TV, and none was provided to the media by official outlets. No warning sirens were sounded throughout the state. It has been reported that an incoming missile from North Korea could reach Hawai‘i in 15 to 20 minutes. The state has no nuclear shelters. 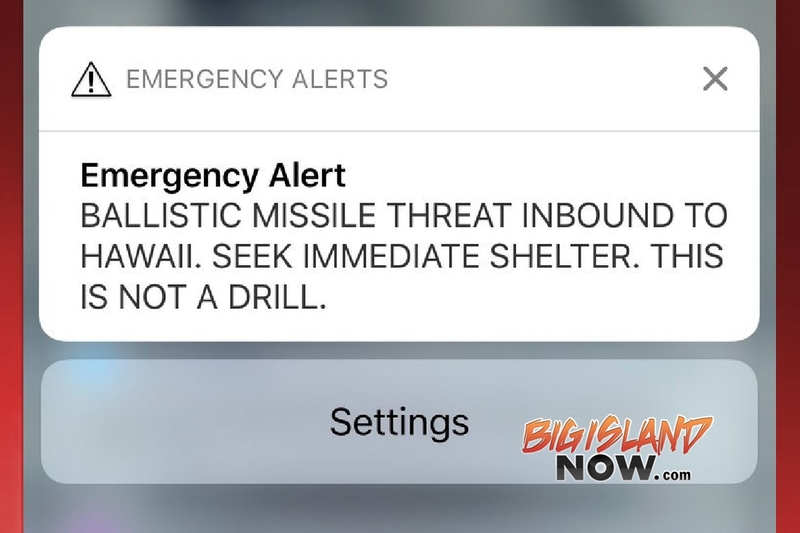 As tensions between the US and North Korea continue to escalate, Hawai‘i has resumed the monthly tests at 11:45 a.m. on the first business day of every month to inform its residents of an impending nuclear attack. However, authorities say the possibility of a North Korean nuclear strike is unlikely. 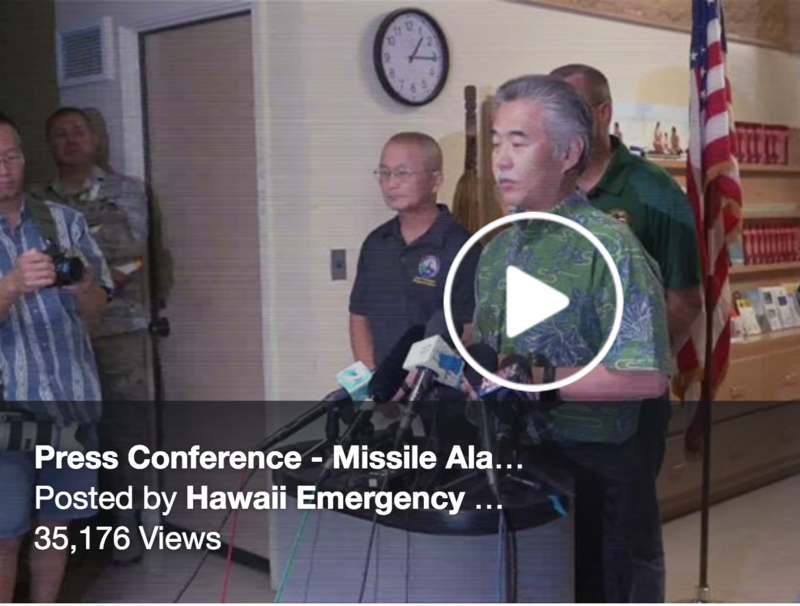 No the statement they MEANT to issue was, “We cannot apologize enough for the costly mistake of issuing a false nuclear missile alarm to the citizens of Hawaii. We are looking into this matter and will ensure it will not repeat in the future.” You don’t just tell people to DISREGARD after all that mayhem. An apology is due IMMEDIATELY! 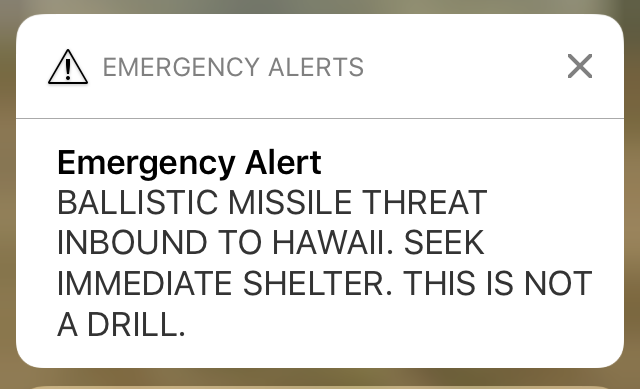 If this was an actual warning, not a false alarm, Hawai‘i residents and visitors should immediately seek shelter. Again, the state has no nuclear fallout shelters. One gallon of water per person per day for drinking and sanitation. Battery-powered or solar-powered radio with extra batteries. Debit and credit card information. Copy of prescriptions and dosages. Plastic bag and ties for personal sanitation. Extra cash in small bills.